always standing room only. She literally lights up the room! stumbling blocks that have held me back, fall away. "Mary is a very caring energy worker who always has your highest potential in mind. I had a session with her and felt very good afterwards. 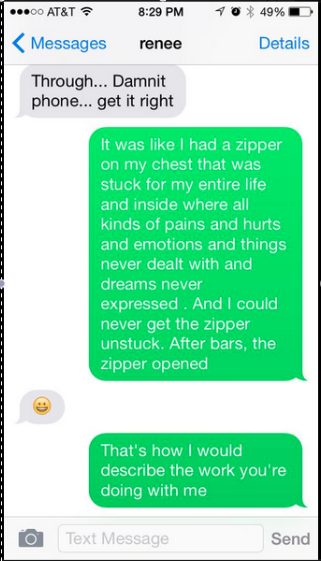 The very next day I was speaking to my sister and had a realization of something that I had repressed from childhood. I had blamed myself for something I did as having caused a terrible event, even though it was not my fault. Yet I took on the point of view of being wrong in a way that was fundamental and hidden from me. This has affected me in more ways than I can say. Mary's work allowed this information to unlock and is enabling me to heal and move forward, whereas before I would continually sabotage myself. Pretty powerful stuff!" Mira Gibson ..... "Transform you life! It's easy! My gorgeous mother Mary Guariglia (look at this picCLICK! I won't say her age, but my goodness, she's aging in reverse!) has been a pioneer at the forefront of health, wellness, and spiritual fortitude her entire life. She offers group classes in the modality of Access Consciousness (NY Access Consciousness Community Access Consciousness™ - Party in Los Angeles! Access BARS swap NYC) as well as one-on-one sessions, which for me personally has had a positive impact on my life. I used to fantasize about "living and breathing the written word" (while slogging through a job that left me drained and uninspired) but it is thanks to my mother and her pointed direction and support (at times brutally honest!) that I can now say I am a full time writer and have never been happier! Seriously, she's introduced me to tools that have completely transformed my life! (And they're easy.) It doesn't matter where you live or at what stage of fulfilling you're aspirations you are, if you'd like a boost, to take things to the next level, if you'd like to transform your life, I recommend you contact her and begin your journey to living the life you've always envisioned for yourself. I'm not posting this to help her. I'm posting this to inspire YOU. I used to think my dreams were just that, but now I am living them. But seriously, this pic is INSANE. My mom's a foxy lady!" How did I get so lucky? Mira Gibson is an example of what else is possible when one uses the easy, simple and fast tools and techniques. It just takes a commitment to self to never stop, never give up and never quit. She is an example of one who used the tools and techniques and saw the results and now can add this to her life. 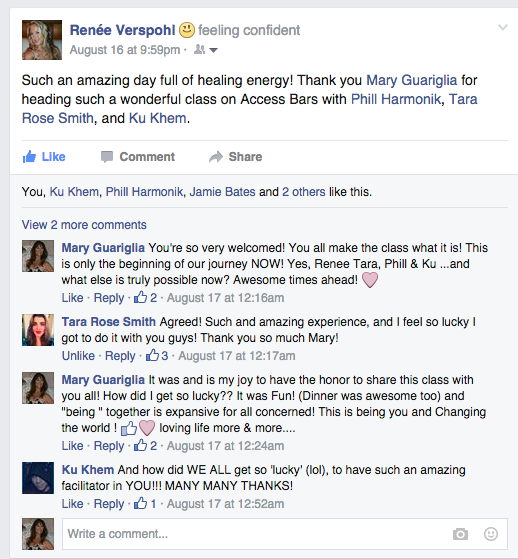 A Testament to Access Bars® Energy session With Mary Guariglia. A bit of how it kick started her Transformation. As RoseMarie Crouse looked back on the history of her transformations, she discovered that the first session with Access Consciousness Bars Certified Facilitator, Mary Guariglia, had a definite impact on her deeply and subtly. This is what RoseMarie Crouse discovered. She since has taken the Bars Class also, and been trading the Bars Energy sessions with others, and using more of the Access Consciousness processing tools for change with Mary. It is awesome to see the results in others on a deep level and lasting level of change. She continues to keep connected with the tools and uses them daily. "Thank you for the wonderful time today. Your generosity, enthusiasm and warmth. Just wanted to tell you how well I am doing. I did a session with my daughter and one with Donna. I liked Donna very much and it looks like we are going to be regulars. So far this is what I noticed. After the class with you I felt “high” for a couple a days. I feel generally happier and find myself singing spontaneously. Saturday night we had our yearly Tennis Party and I was paired up with much better players then myself. They were not very nice to me, but instead of feeling bad about myself I realized that it was their problem not mine. YEAH! This is something I counseled with my group about for years (feeling bad about myself that is) What else is possible? if anyone deserves to get to where they want its you! I'm 34 so I consider myself very lucky to have had the opportunity to spend as much time in the fire at such a young age as I have I'm learning to focus on the greatness of others in order to learn so at some point in the very near future i can lead. I truly admire you and will be able to fly us all to a beautiful place for the weekend very soon…I hold you very close to my heart, i have adopted some of you sayings as my own and they will live and be shared as long as iI have…I just want you to know that you have had a tremendous impact on my life even though we haven't done biz together funny huh? so as my mentor would say what else is possible? Yes most likely cos you are that too! I will love to meet you personally soon..it will be amazing..YES<YES YES.. It is all wonderment! and beautiful beyond measure.. NOTE: This result within the week of learning and taking the 8 hour Bars Class with me and using the technique she learned on her client of many years using acupuncture technique. The Bars® highly complimented Renee in her expanding her services to her clients and this one gal saw results as described above. Please Know that not everyone will see this clearly and this fast. The session is dictated by the client and what they and their body is willing to let go. One thing is for sure, the bars are a de-stressor and a compliment to any modality in the healing arts. On it's own, it can give you some peace and/or change your entire life to what you truly desire without limitations. What else is possible here for you?